Ban Haad Sai The two pavilions, each with 330 square meters of living space and deck and courtyard area, are situated side-by-side overlooking a beautiful white sandy beach with Koh Phanghan in the distance. There is a large living room equipped with all amenities, including satellite TV and a music system. Sliding doors from all of the living areas and main bedrooms open onto large teakwood decks, ideal for dining or simply relaxing with a good book. 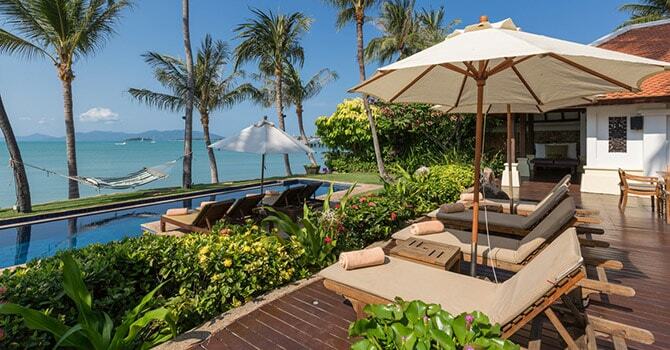 The villa enjoys a stunning location close to Bangrak Beach, with views over Koh Phangan and the Big Buddha. Koh Samui’s most famous attractions are also conveniently located, with the Big Buddha, Fisherman’s Village and Choeng Mon Beach all less than ten minutes away. 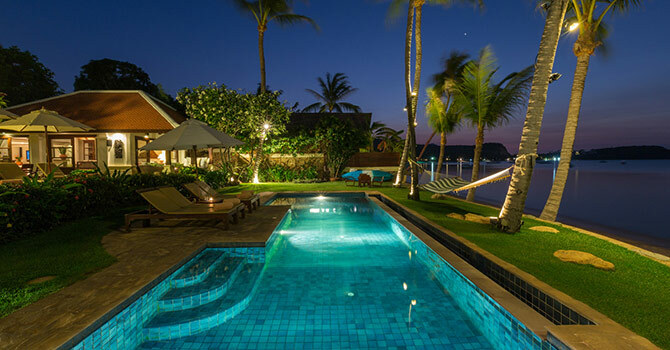 - The villa can host up to 60 guests in buffet style event. - Events fee is USD 1,200 for 21-60 pax. No premium for up to 20 pax for event. - Require 14 nights minimum stay over Christmas/New Year period. - Extra bed at USD53+ per night per person. Max 2 extra beds. Early bird enjoys 10 % discount when booking 150 days in advance. 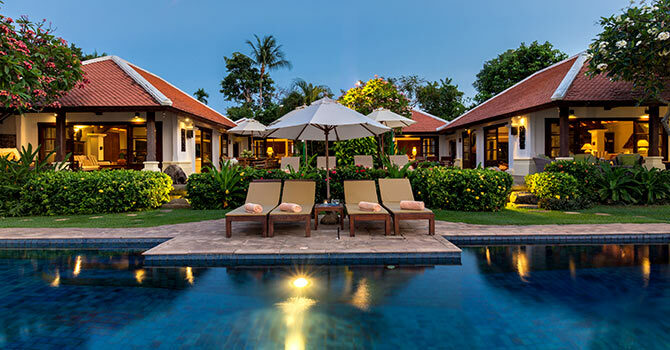 With up to seven bedrooms, the villa’s layout is flexible and responsive. The bedrooms are spread over several pavilions. Two pavilions each feature three bedrooms (two double bedrooms and a twin), each with a modern ensuite bathroom. The seventh bedroom is located in an additional pavilion, adjacent the gym. Each bedroom features its own private ensuite, with the master bedrooms offering outdoor Balinese baths and showers, as well as stunning sea views. Great view and location but past it's hey days We stayed for a long weekend to celebrated our twin daughter's first birthday. The villa has an unparallelled location. It fronts into a long quiet stretch of beach for walks and sunrise/sunset moments and it is a stone throw from nice restaurants. We frequented Fisherman's Village and Cheong Mon beach which were all less than a 10 minute drive away. Don't think you can find a sweeter spot than this. That said, there are some home(villa) truths that one should be aware of too. All the photos of the villa are all posted by the Management Co. In reality, the villa's interior esp bedroom, cabinetary, furniture and drapery are all very dated. With it comes old faucet issues and shower drainage problems. It's layout is also maze like interwoven by garden and individual pavillions. Not for you if you are one for modern, open villa layouts. We had young babies and the previous reviews all raved about the team which is why we considered this villa to begin with. Our experience was quite the contrary. 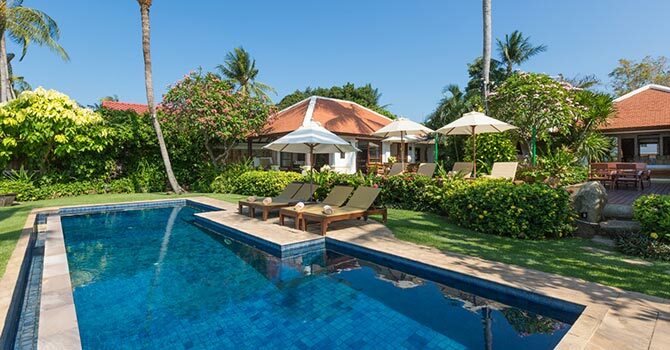 The villa is marketed with a live in team of four, a villa manager, Am, a cook and another 2 staff. Apart from breakfast and turn down service, they were no where to be seen and we had to specifically look for help when we need it. They seemed reluctant and displeased each time we asked for something. There was no offical check in briefing as to where everything went, explanation on laundry, use of electrical appliances, meal planning, etc. The live in team was also the ' grumpiest' I have ever encountered over my holidays and career in hospitality. For example, we decided to bake the babies a cake, we did not ask for help but Am offered so we said Yes. When the cook came in to help, she out on some real attitude in kitchen. There was definitely something wrong with the whole team. If one has small children and needs lots of support, there are lots of options out there for sea fronting villas, especially if you are going to fly all the way in and fork out over U$1000 a night, you may not want negative vibes looming over your holiday.